Enhance the safety and protection of response personnel and all components of the EMS system with the 2018 edition of NFPA 473. NFPA 473: Standard for Competencies for EMS Personnel Responding to Hazardous Materials/Weapons of Mass Destruction Incidents identifies the levels of competence required of emergency medical services (EMS) personnel who respond to incidents involving hazardous materials or weapons of mass destruction (WMD). It specifically covers the requirements for basic life support and advanced life support personnel in the pre-hospital setting. The 2018 edition works to improve coordination between personnel. Greater detail is provided for emergency medical services personnel to coordinate with the hazardous materials safety officer. Revisions improve consistency with the other hazardous materials response personnel documents. Other updates reflect industry-recognized terminology. Interested in other editions of NFPA 473? Use the drop down menu above to select the edition year you need. 1.3 CDC Categories A, B, and C.
4.3 Competencies — Planning the Response. 4.5 Reporting and Documenting the Incident. 5.2 Competencies — Analyzing the Hazardous Materials Incident. 5.5 Competencies — Terminating the Incident. 6.2 Mission-Specific Competencies: Advanced Life Support (ALS) Responder Assigned to a Hazardous Materials Team. 6.3 Mission-Specific Competencies: Advanced Life Support (ALS) Responder Assigned to Provide Clinical Interventions at Hazardous Materials/WMD Incident. 6.4 Mission-Specific Competencies: Advanced Life Support (ALS) Responder Assigned to Treatment of Smoke Inhalation Victims. Enhance the safety and protection of response personnel and all components of the EMS system with the up-to-date rules in the 2013 NFPA 473. Update to the 2013 Standard to make sure you keep pace with evolving issues in the field. 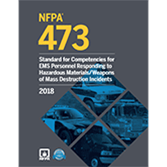 To make sure that EMS responders have an understanding of today's challenges and the measures and procedures to provide appropriate care, the 2013 NFPA 473 adopts the concept of mission-specific competencies that were previously integrated into the 2008 NFPA 472. This new edition is expanded to include a new Chapter 6: Competencies for Advanced Life Support (ALS) Responders Assigned Mission-Specific Responsibilities, including being assigned to a hazardous materials response team, to provide clinical intervention at hazardous materials/WMD incidents, and for treatment of smoke inhalation victims. A new Annex C: Toxicity Analysis and Antidote Tables includes information on hazmat biodromes, bioagent mass casualty antidotes, hazmat toxidromes, and hazmat antidotes. Definitions have been revised for clarification and editorial changes have been to simply, standardize, and provide consistency.